Jacquelyn Rae (Schwantz) Hokanson was born on May 18, 1934 to LeRoy and Eva (Cary) Schwantz in Bertha, Minnesota. Jacquelyn attended Bertha High School, graduating with the class of 1952. On July 11, 1959 Jaquelyn was united in marriage with Jerome Hokanson in Elko, Nevada. Their marriage was blessed with four children: Pam, Pat, Peggy and Mike. They made their home in Colorado, Idaho and Montana where Jerome was employed setting power poles. In 1961, they moved to Crosby-Ironton, Minnesota, then made their home in Verndale, Minnesota in 1964. Jacquelyn was employed with the Verndale School for 26 years, retiring in 1996. 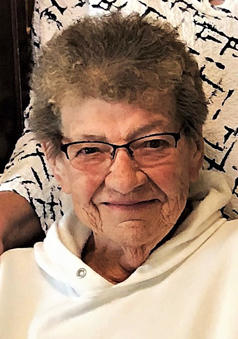 She was an amazing cook who also enjoyed flowers, gardening, quilting, making blankets for family and friends, mowing lawn, and when she purchased a riding lawn mower she even enjoyed “manicuring” her neighbor’s lawns. Her family and friends were so very important to her and she loved them all with her whole heart. She will be missed so much by all that knew her. She is survived by her daughters: Pam Hokanson and Pat (Joe) Doeden; son Mike (Julie Spaeth) Hokanson; grandchildren: Ben and Anna; many other relatives and a host of friends. Jacquelyn is preceded in death by her parents: LeRoy and Eva; husband, Jerome; daughter, Peggy; and her brother, Bob.